he'll make you forget that this is a post of cards thrown together with little to no thought or common theme. 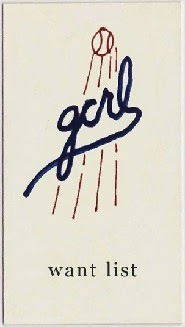 just a bunch of cards i have scanned over the years, but not posted for one reason or another. 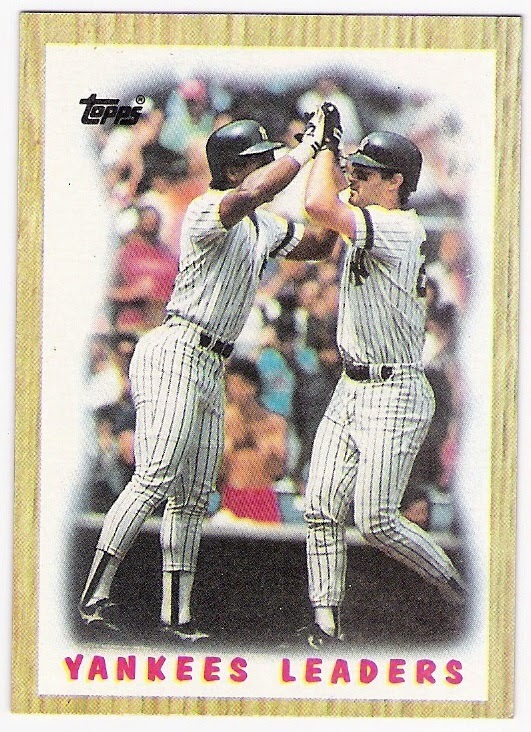 as an aside, i forgot all about this card when i went to a signing that erickson attended three years ago when the twins celebrated the 1991 world series team. that's ok - his wife was there, and i forgot all about baseball cards for a moment. 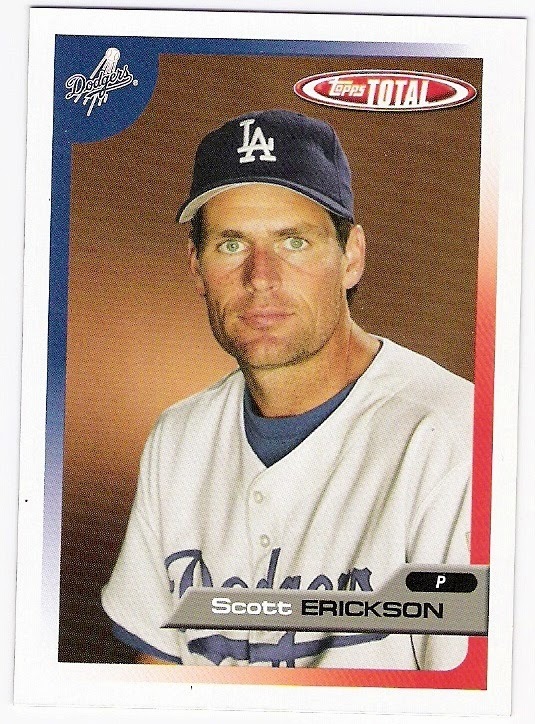 jackson made his big league debut on his 20th birthday (9/9/03), squaring off against randy johnson and the diamondbacks. the dodgers made him a winner that day, and again a couple of weeks later in san francisco (a game that i attended). jackson was wild in that game, walking 8, but he struck out barry bonds and allowed no runs and only 2 hits in his 6 innings of work. 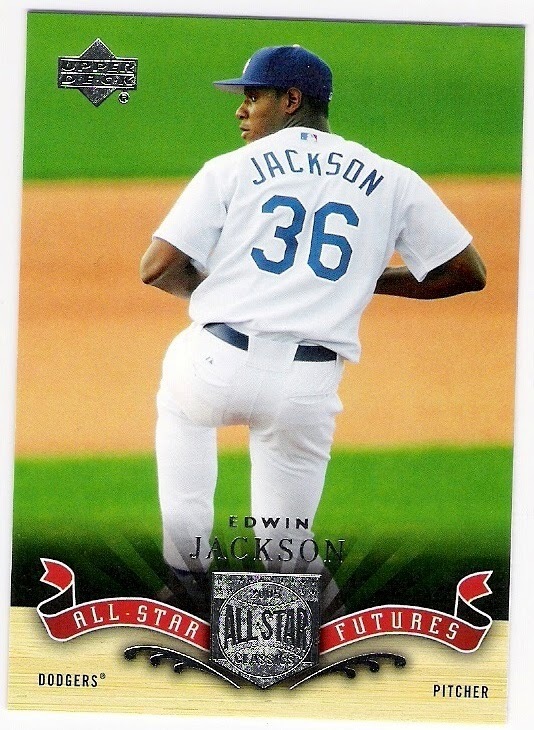 jackson was back with the dodgers for a handful of games in 2004 and 2005, but was traded to the devil rays prior to the 2006 season. in his 12-year career (so far), jackson has pitched for 8 teams. 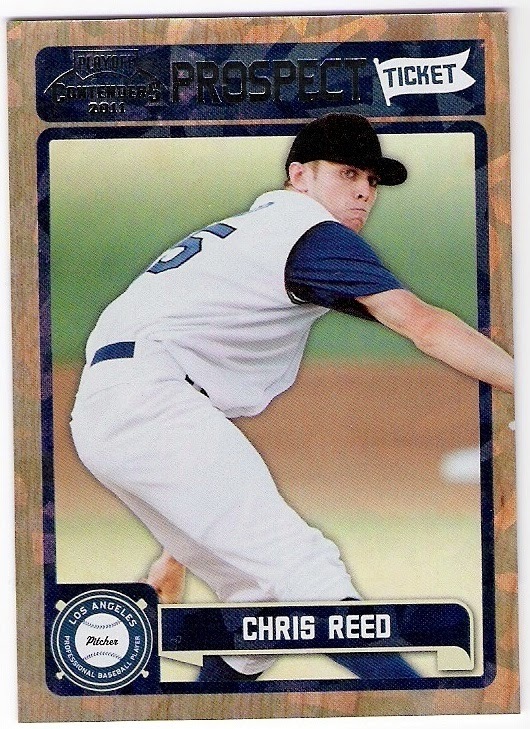 reed was the dodgers' first round pick in 2011. he was born in london, but attended high school in socal and went to stanford after that. he's currently a double-a chattanooga. ethier only gets one parallel in this post, but lilly gets three. 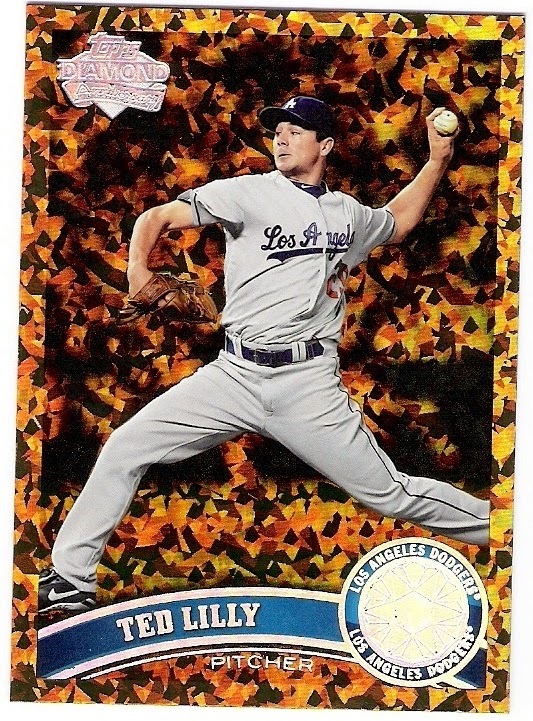 i still prefer lilly's 2013 topps card. 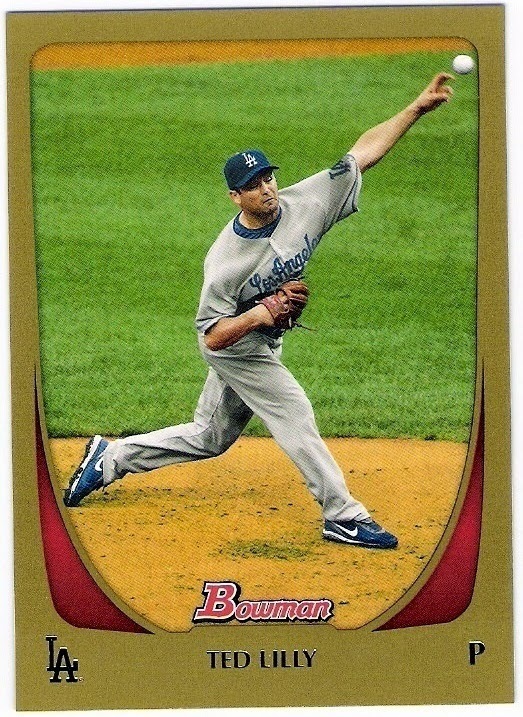 here's a few more from 2011 topps update. 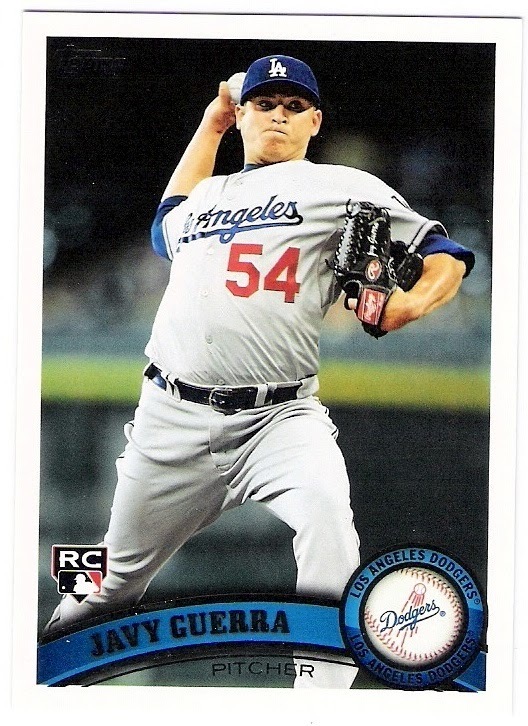 remember javy guerra? guerra was picked up on waivers by the white sox earlier this year, so he and ronald belisario are making it deja vu all over again in the chisox bullpen. 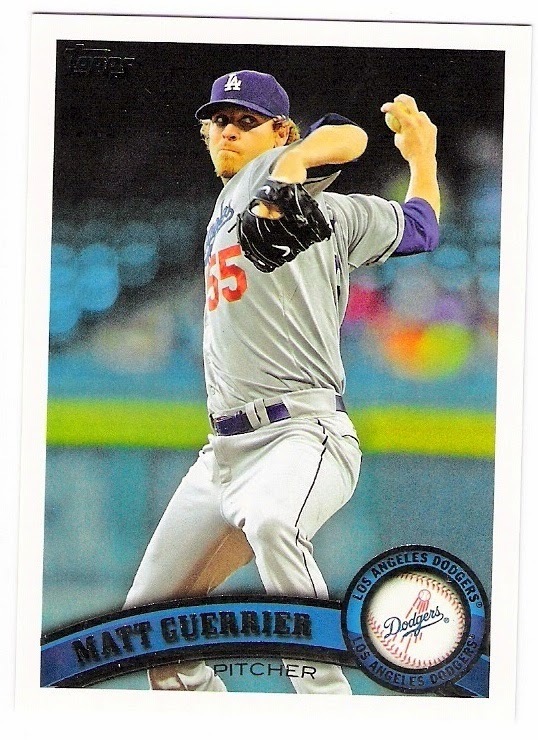 guerrier was dealt to the cubs last year for carlos marmol, but signed with the twins prior to this season. 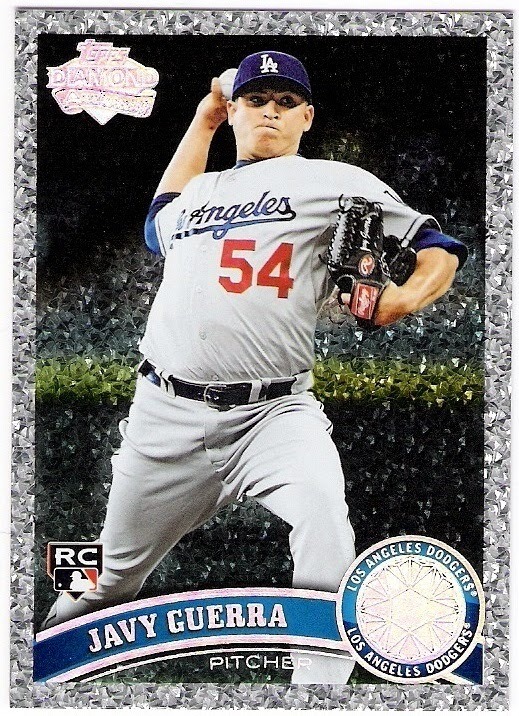 he was just recently dfa'd by the club, although aside from his last outing he hadn't pitched that poorly. 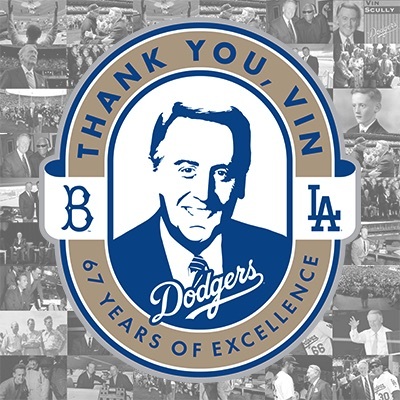 i was a fan - as much as one can be of a non-closer reliever. 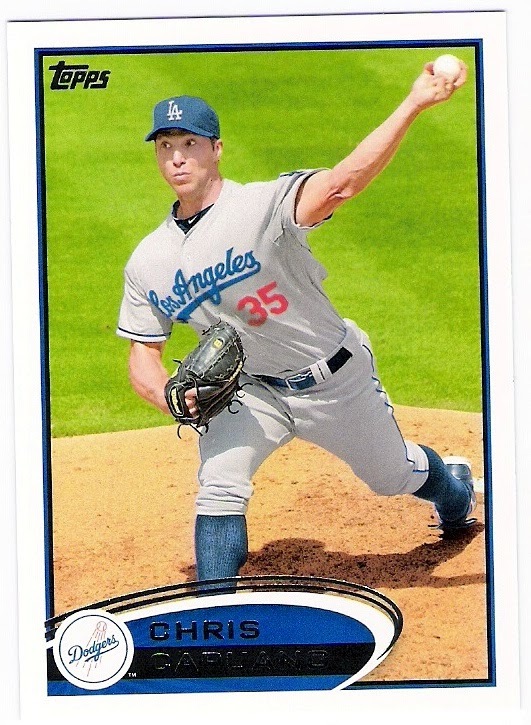 he had started the season with the red sox after two years with the dodgers, but was released on july 1. after a short stint with the rockies' organization, capuano had his contract purchased by the yankees and made a start for them just the other day. he turned in a quality start, but didn't get a decision. here are some more sheets from my steve garvey oddball binder. 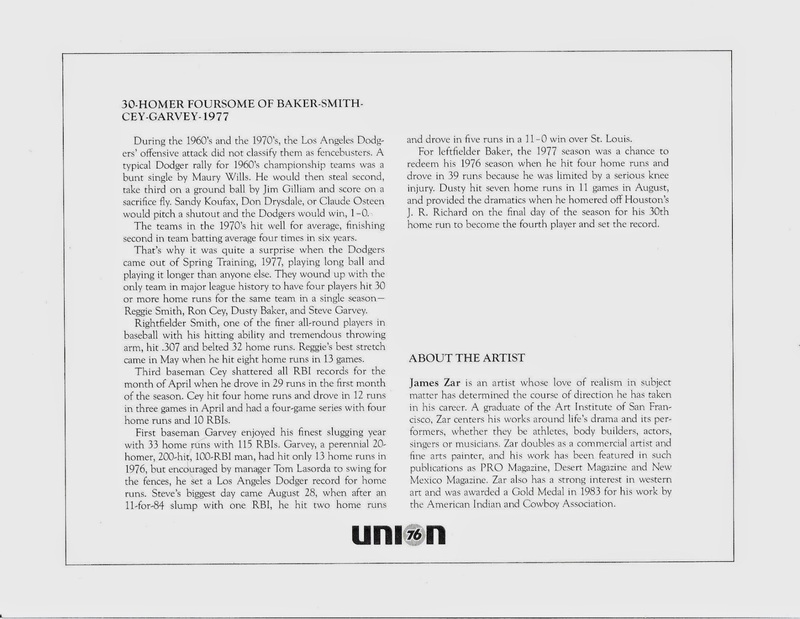 these come from the 1984 union oil dodgers most memorable moments set. 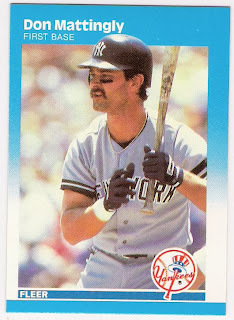 similar to the 1982 volpe portraits, these were available at your local southland 76 station (murph was the proprieter in the commercials, i believe). there are some good moments captured in these sheets, including bob welch's strikeout of reggie jackson in game 2 of the 1978 world series and roy campanella night at the coliseum in 1959.
garvey shows up on 5 of the 16 sheets in the set, and those are the ones in the binder. 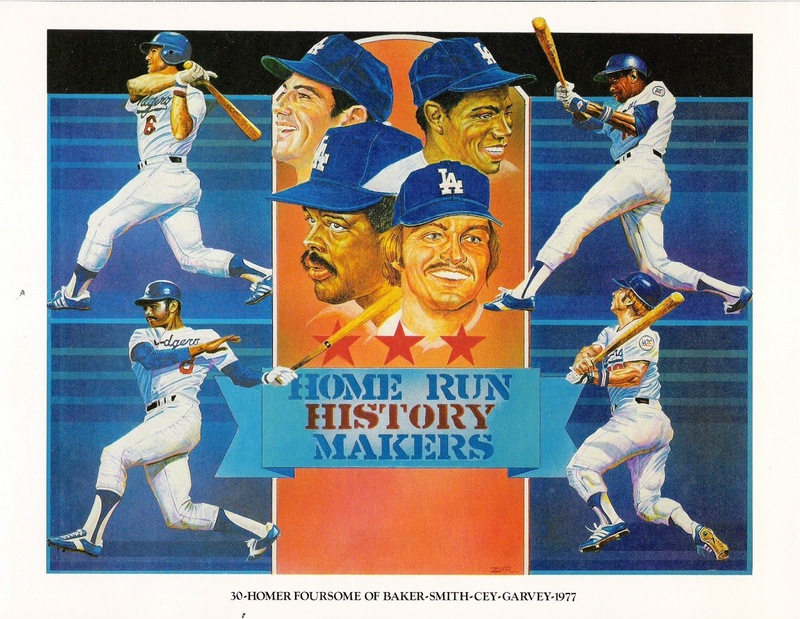 in 1977, garvey, dusty baker, reggie smith, and ron cey became the first four teammates to hit 30 home runs in the same season. 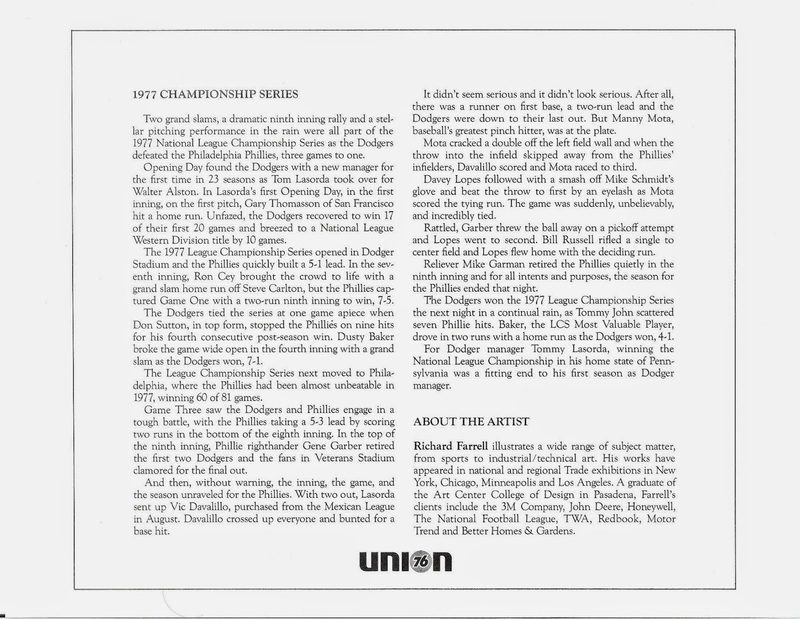 topps didn't make a card (so i did), but seven years later, union oil came through with a sheet. garvey shares space with teammates cey, baker, bill russell, davey lopes, vic davalillo, tommy john, manny mota, and don sutton. cey is front and center on the sheet, but dusty baker was the series mvp with 2 homers and 8 rbi. 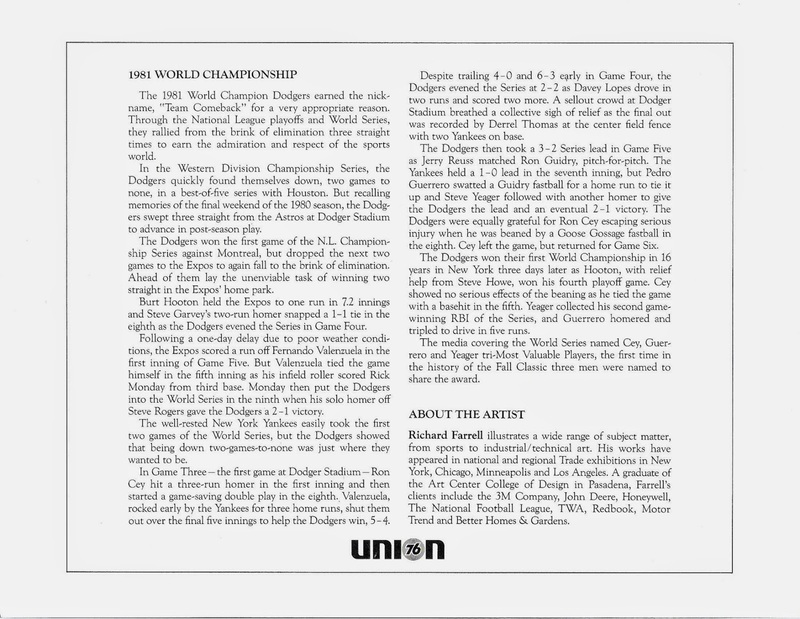 the majority of the text on the back pertains to game 3 of the series (black friday as it's known in philadelphia) wherein the dodgers used a bunt single by davalillo, a double by manny mota, and an infield single by davey lopes to tie the score, all with two outs. an error and a bill russell single later, and the dodgers had taken a two games to one lead in the series. 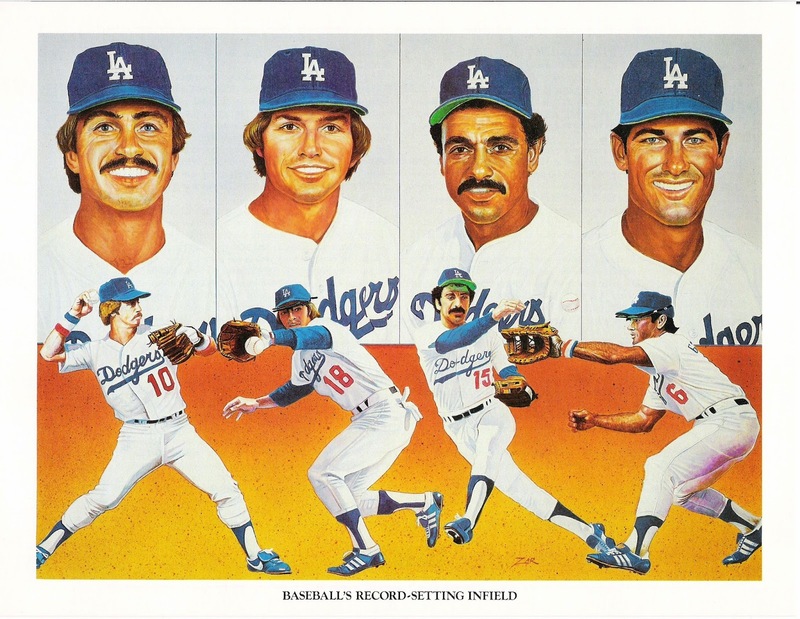 this sheet is a tribute to dodger fans, with garvey, cey, sutton, mota, jerry reuss, and joe ferguson appearing on the front. 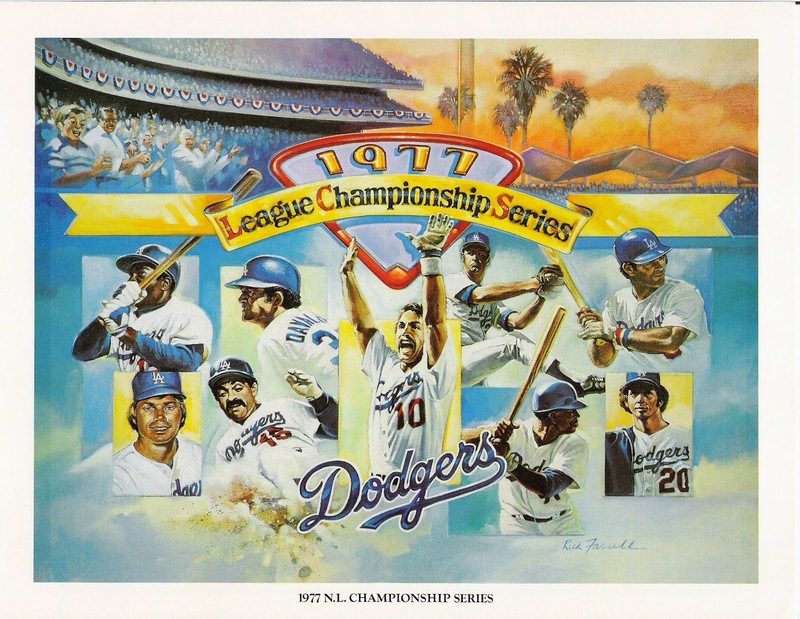 the fan tribute is centered around the end of the 1980 season when the dodgers were three games out of first with three to play. as luck would have it, the astros were coming to town. the dodgers swept the series behind some big home runs by ferguson, garvey, and cey, but lost game 163 as the astros advanced to the postseason for the first time. garvey shows up on this one as part of the three-steves celebration - jumping in the air after the dodgers' game 6 win with steves howe and yeager. 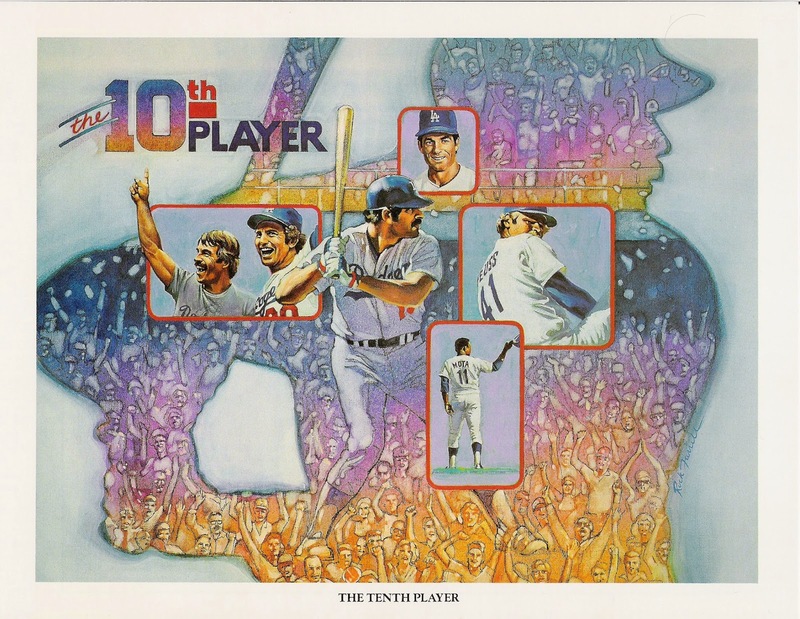 also appearing on the sheet are series co-mvp's cey, yeager, and pedro guerrero. tommy lasorda and nlcs hero rick monday round out the sheet commemorating the dodgers' first world championship since 1965, and first reached by beating the yankees since 1963.
this is, quite obviously, my favorite sheet. it's all about the infield. more garvey goodness to come; stay tuned. 1978 topps was the first set i ever completed. it took me most of the summer of 1978 to do it, but i built the set through packs and neighborhood trades and singles purchased at the local card shop. 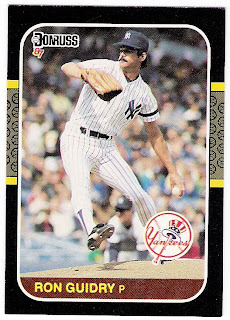 although i had been given a pack of 1977 topps the year before, and somehow had a few 1971 cards in my collection, it was the 1978 set that spurred my dedication to the hobby. 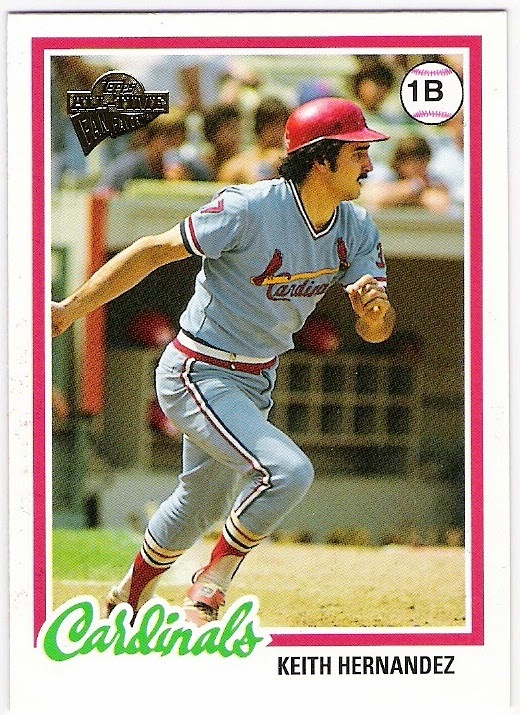 i also spent a couple of weeks in the great white north that summer, and bought up packs of 1978 o-pee-chee cards, enjoying the variations that mixed the topps photos with new teams for some players and the clarifying text that was added to those cards. i didn't finish the o-pee-chee set until the early 2000's, however, but once it was completed, i turned my attention to the other 1978 variations. 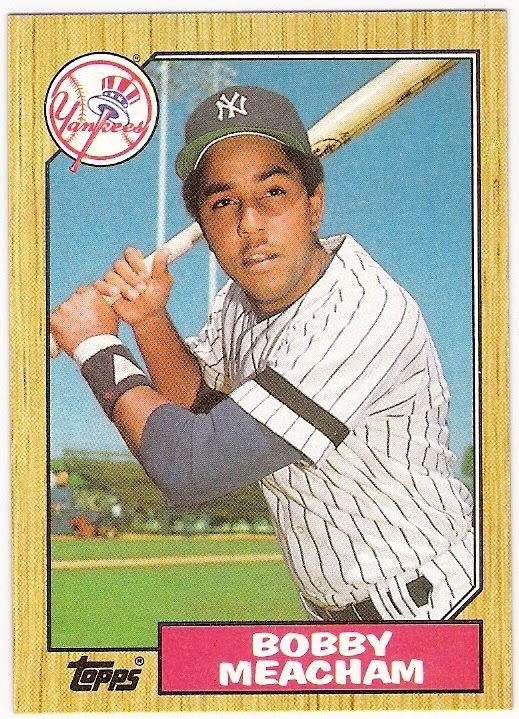 there was the 1978 topps zest willie montanez card, and the 1978 topps burger king cards issued for the rangers, tigers, yankees, and astros that included several cards not in the 1978 topps flagship. beyond that, there are the cards that topps made as part of their archives and fan favorites sets using the 1978 design. 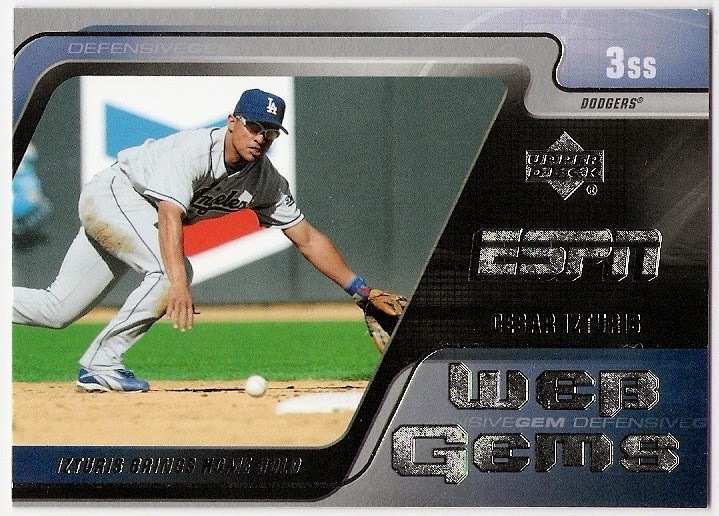 i showed most of them in this post, but left out two from the 2004 topps all-time fan favorites set. 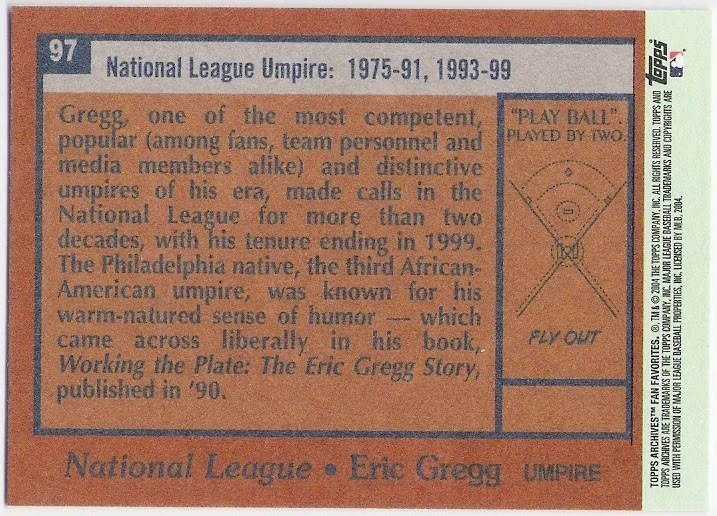 there is no mention of the generous strike zone gregg employed in the 1997 nlcs. 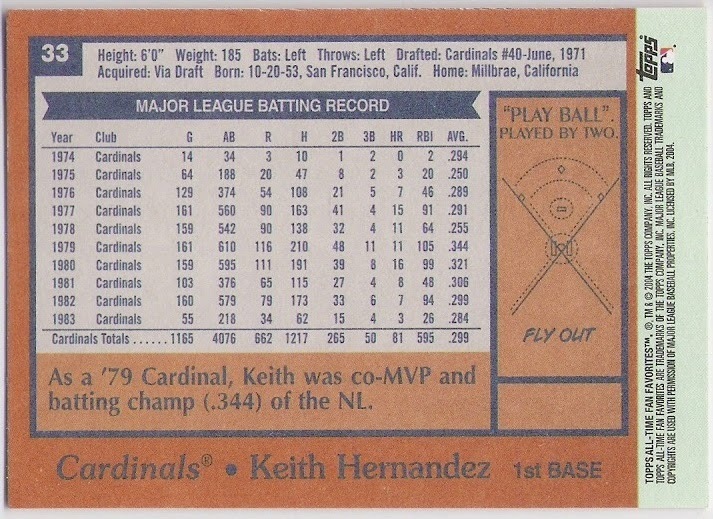 except for the stats beyond 1977 and the text reference to his 1979 co-mvp and batting title. 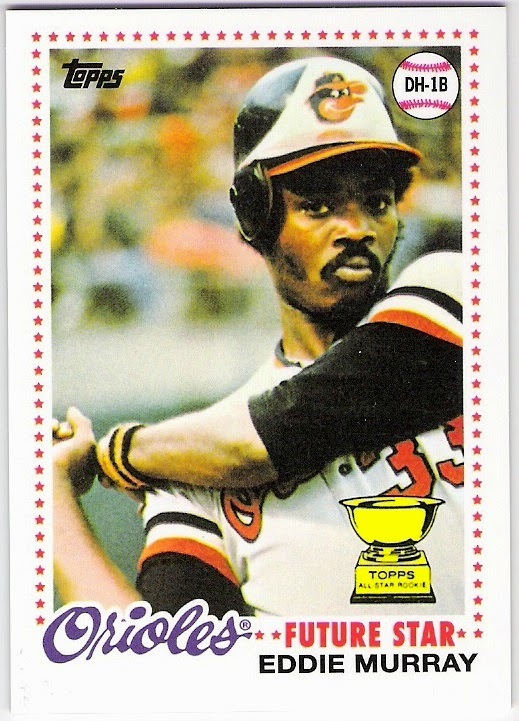 it's a 'future stars that never were' card, re-imagining eddie murray's 1978 topps rookie card as a 'future star' subset card, had there been one in 1978. topps did a nice job of using the stars that they used on the 1978 highlights cards, so i see how this design could have fit into the set. 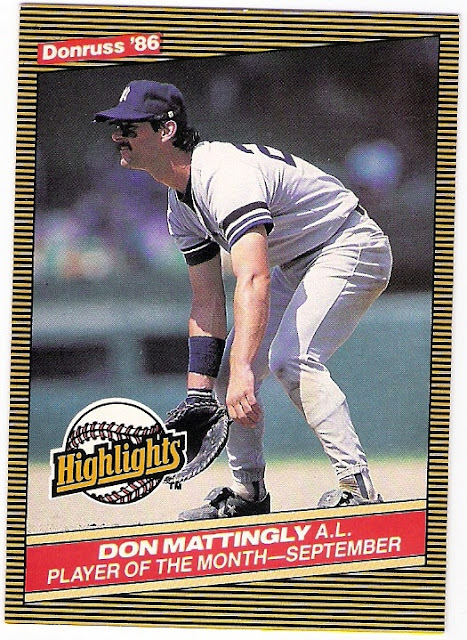 however, i would have preferred to see a card that should have been of paul molitor, alan trammell, lou whitaker, dale murphy, or some other player who was featured on a multi-player rookie card that year instead of murray. i'll still take it, though. 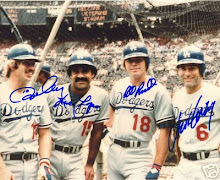 none of the three 1978 topps dodgers who were featured in the 1992 set dropped out in 1993, and they were joined by another member of the club. 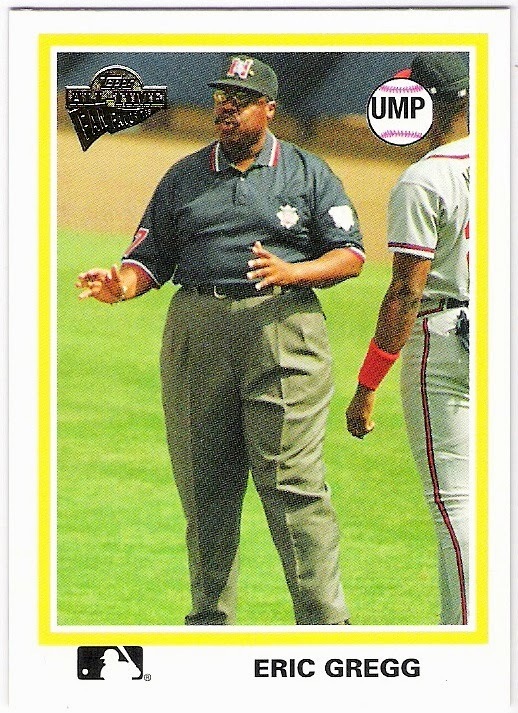 topps went to a dual manager format in 1993 for the first time. 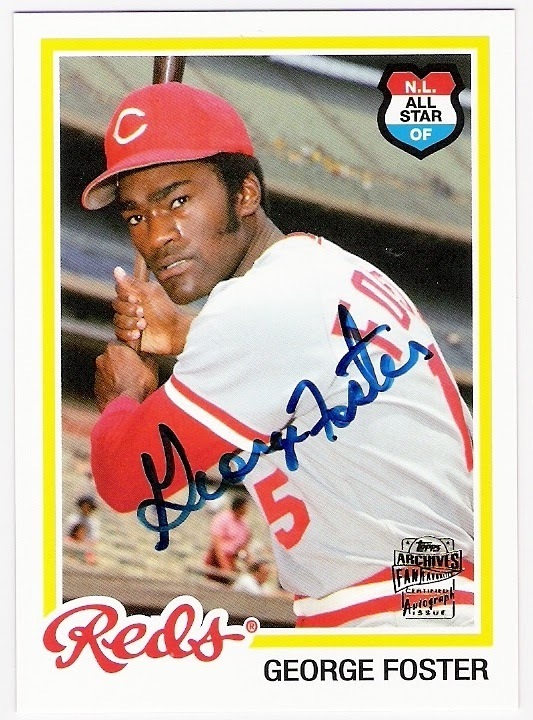 it calls to mind the dual all-star player cards of 1973 and 1974. anyway, hal mcrae joins tommy on his card and he brought the royals back to the right side of .500 in 1993 just like tommy (almost) did. 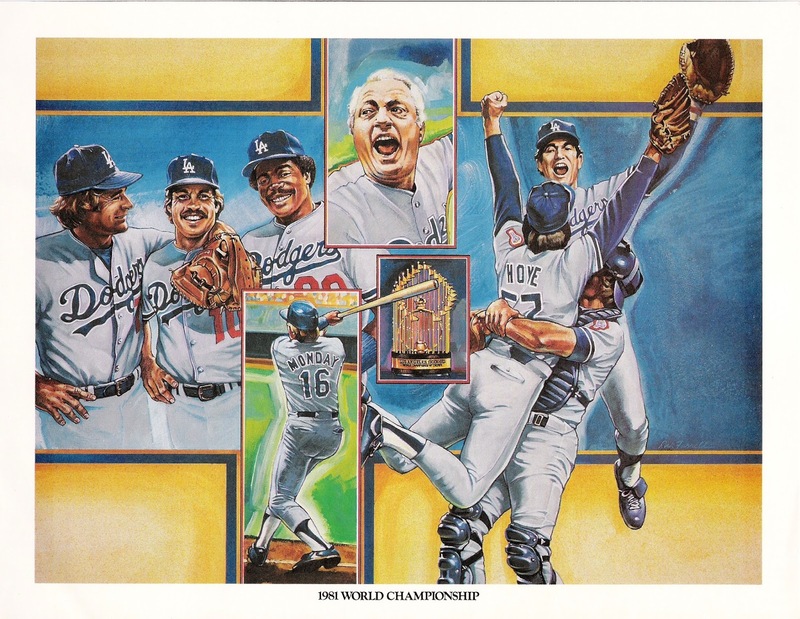 lasorda's dodgers, having lost 99 games in 1992, rebounded to finish an even .500 at 81-81 in 1993. this was due in no small part to the arrival of mike piazza, who hit 35 homers with 112 rbi and a .318 batting average in his rookie season. 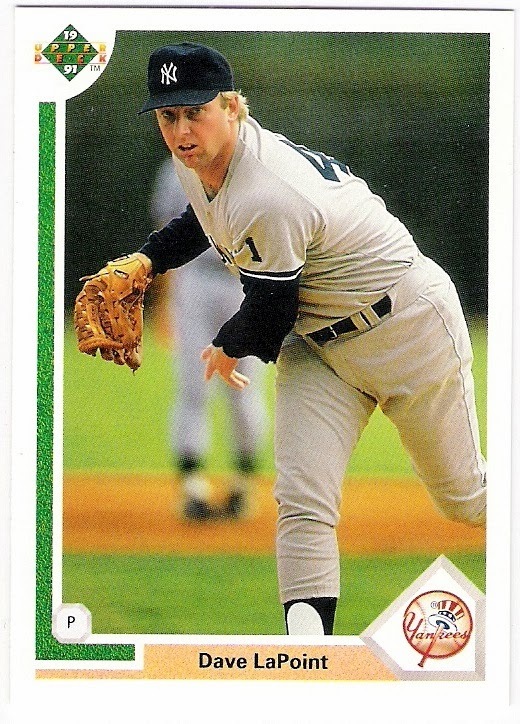 hough had signed with the expansion marlins as a free agent following the 1992 season, and he wound up making the first start in franchise history. as such, he recorded a lot of franchise firsts in that game against (who else?) the dodgers. 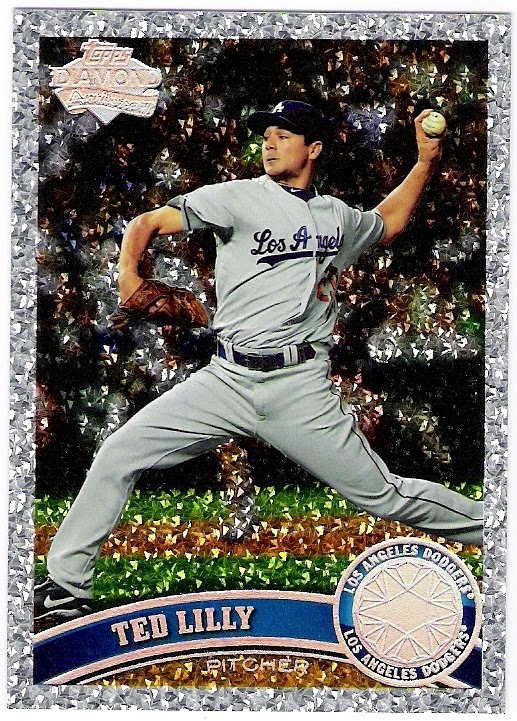 he was the first marlin starting pitcher, the first to strike a batter out, the first to issue a walk, the first to allow a home run, and the first to record a win (yes, the marlins beat the dodgers in their first ever game). 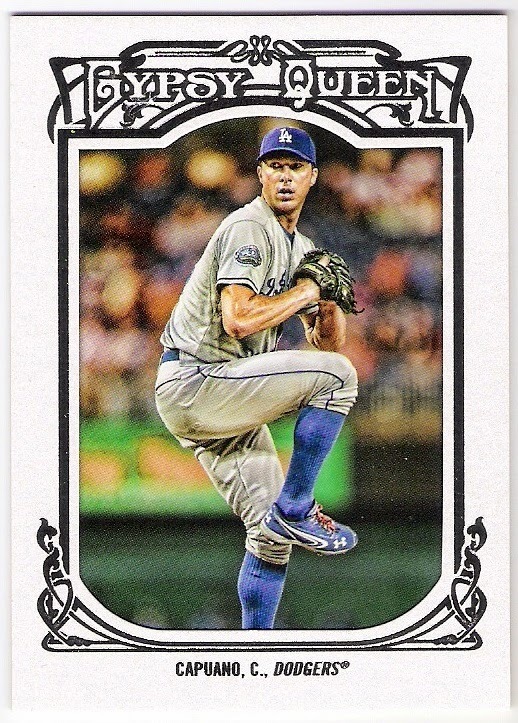 when the season ended, hough was 9-16 with a 4.27 era in 34 appearances, all of them starts. he even recorded a couple of hits in his return to the national league, where he was the oldest player on any roster. oates shares his 1993 topps card with hall of fame manager bobby cox, inducted to the hall just last weekend. oates in 1993 led baltimore to their second straight winning season at 85 wins and 77 losses. that was four fewer wins than the team had posted in 1992, but the finish was the same: 3rd in the american league east. 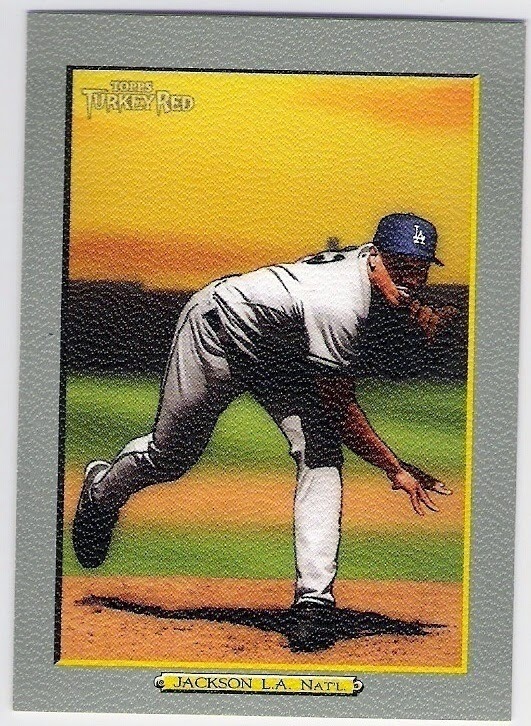 oates' pitching staff in 1993 included fernando valenzuela, whom oates narrowly missed having as a teammate with the dodgers. he did manage a former dodger teammate, however, as rick sutcliffe was a member of oates' starting rotation in both 1992 and 1993 for the orioles. baker gets to share space with blue jays' manager cito gaston whose team won the world series for the second straight season in 1993. baker meanwhile was brought in to replace roger craig as the giants' field leader following a 90-loss season and 5th place finish in 1992. the giants turned things around for baker, winning 103 games in 1993. in 1992, that would have been plenty of wins to garner the nl west title, but in 1993, it was one game short. the braves, winners of 104 games in 1993, took the crown thanks to a dodger beatdown of the giants on the final day of the regular season. i still recall baker choosing to start rookie salomon torres in game 162 and mike piazza hitting two home runs (including a grand slam) to end the giants' season. i was happy to see dusty back on the diamond and back on cardboard, but also pleased that he wasn't taking the giants into the postseason. roger maris, one of the yankees' famed 'm&m' boys, died in houston on december 14, 1985 at the age of 51 due to cancer. 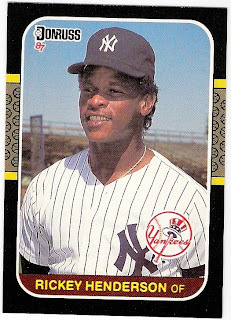 the yankees added a black armband to their uniforms for the 1986 season in his memory. 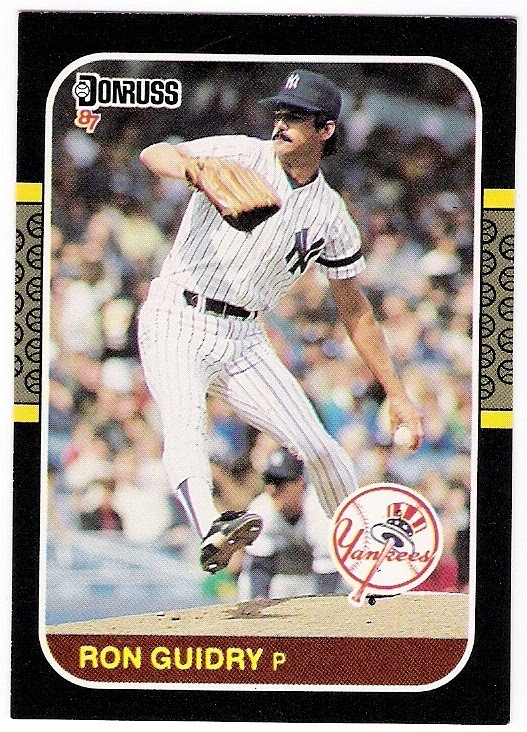 thanks to the sheer number of cards produced in 1987, there are lots of examples. this first one is a 1987 topps glossy send-in card of rickey henderson. 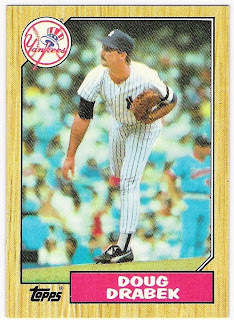 in the end, i think it's a higher likelihood that the 1987 topps card features a photo from 1986. besides, it features the yankee pinstripes. maris famously hit 61 home runs in 1961, eclipsing babe ruth's record for most in a single season. 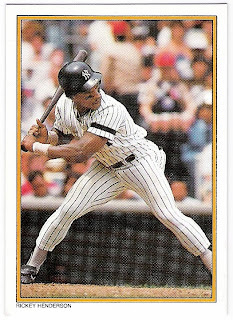 he also led the league in runs scored and rbi that year, won his second straight mvp award, and helped the yankees win the world series, too. he finished his career with the cardinals, including two more trips to the world series in 1967 and 1968. in addition to the armband memorial following maris' death, the yankees had retired maris' number 9 during the 1984 season with maris in attendance. maris was born in minnesota, but the family moved to fargo when he was young. the fargo community still embraces maris as a hero, with many events and other references to him throughout the city. i can say that i have been to the roger maris museum in the west acres shopping mall. they will be the first to point out that maris is still the single season american league home run champ, if not the 'legitimate' champ. billy martin died in a single-car accident on christmas day, 1989. the driver of the car, a friend of martin's, was charged with driving under the influence. 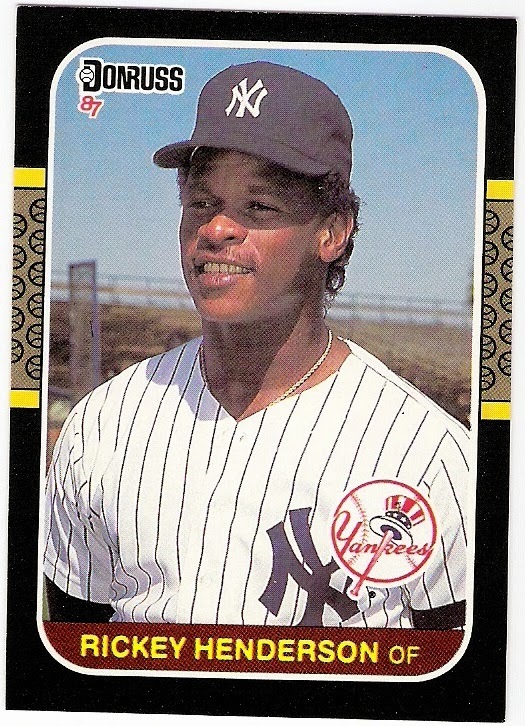 the yankees, the team that martin was most associated with during his playing and managerial days, added a memorial patch to their uniforms from the 1990 season. instead of the traditional black armband, they added martin's retired number 1 to their left sleeves. in a bit of a departure, i decided to use a card from 1993 to represent this particular memorial in the binder. 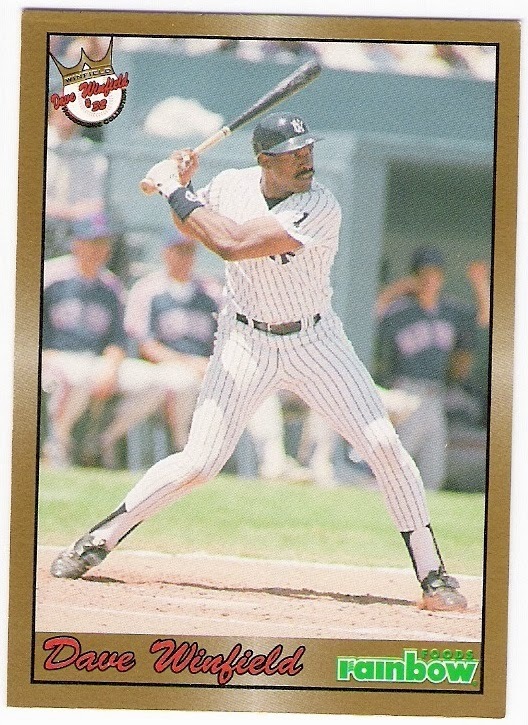 it comes from the 1993 rainbow foods dave winfield set that was released in minnesota (and perhaps elsewhere) to mark winfield's return to the twin cities. 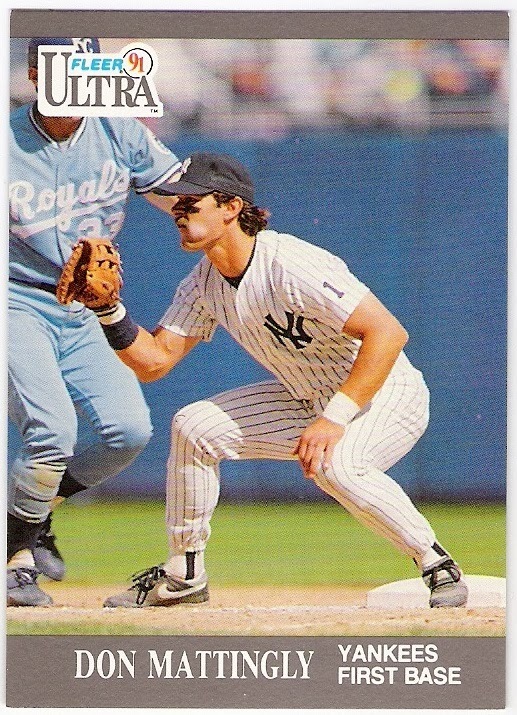 this is a gold parallel version noting his time spent with the yankees. martin had finished his playing career as a twin in 1961, and later returned to the team as their manager in 1969. it was his first managerial job, and he led the team to a first place finish in the first year of division play. after that, martin managed in detroit and texas before taking the job of the yankee skipper in 1975. much turmoil ensued, and despite getting the yankees back to the postseason in 1976 and winning it all in 1977, owner george steinbrenner fired martin 52 games into the 1978 season. of course, the boss hired martin back in 1979, but fired him again. in 1980, martin took over the oakland a's and 'billy ball' was born. martin guided the a's to the postseason in 1981 (they lost the alcs to the yankees), but the team fell to fifth place in the al west in 1982 and he was let go. no problem - steinbrenner hired him to be the yankee manager again, but was fired after a third place finish. 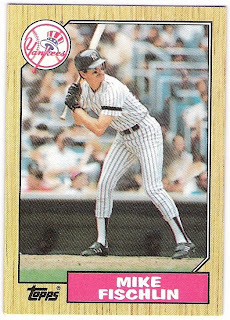 martin returned the the job a fourth time, taking over for yogi berra in 1985, and was fired for a fourth time after the season ended. martin was named the team's manager by steinbrenner for a fifth time going into the 1988 season, but was canned for a fifth time by steinbrenner after 68 games. 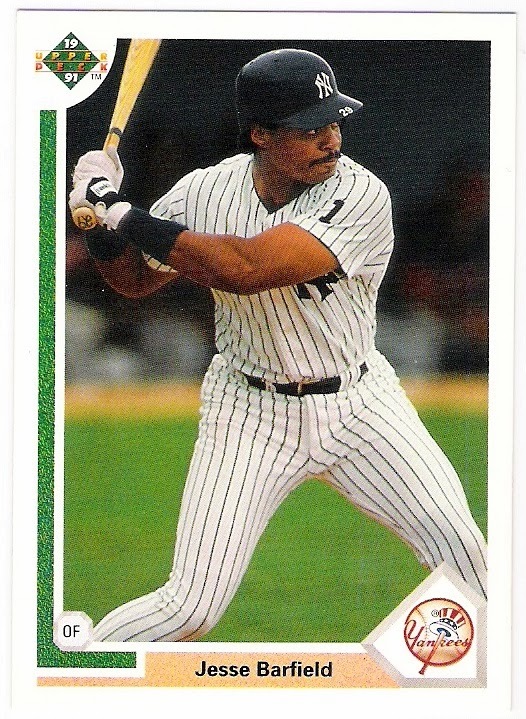 one has to wonder if martin, who was 61 when he died, would have been asked to manage the yankees another time (and been fired soon thereafter) had he not been in the accident. 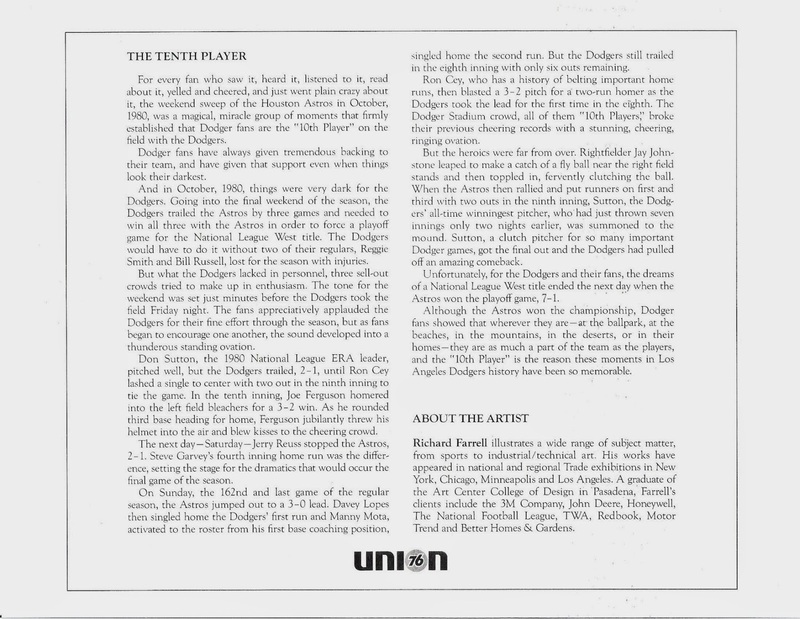 i believe that this is the last of the brooklyn players to have played for the team, left and joined another organization, then returned to play for the dodger franchise once more. art herring was a dodger double dipper. 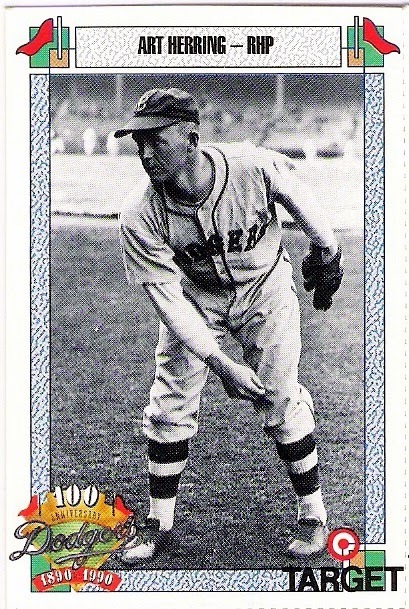 herring had pitched for the tigers for five seasons prior to joining the dodgers for the first time in 1934. he posted a 2-4 record that year, with a 6.20 era in 14 games (5 starts). he spent all of 1935 in the dodgers' minor league affiliate in sacramento, before joining the boston braves' minor league affiliate in st. paul for the 1936 season. herring stayed in st. paul, even as the team became a white sox affiliate in 1937, finally getting back to the majors with the chisox in 1939 for 7 appearances. 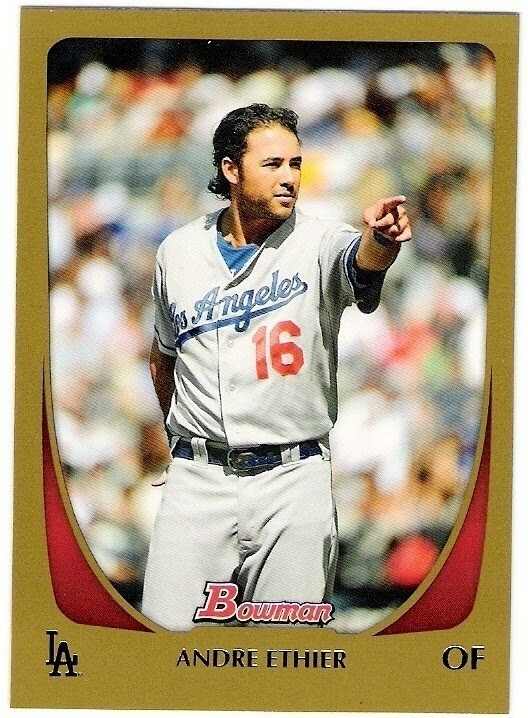 after that, he returned to st. paul, which eventually became the dodgers' double-a affiliate. the dodgers called herring up to the big club in 1944, and he remained there through the 1946 season. during that time, herring compiled a record of 17-10 with a 3.43 era in 69 games. the pirates purchased his contract following the 1946 season, and herring ended his big league career with the pirates the following season. thanks to his long career with the lengthy minor league stretch in the middle, herring went 15 seasons between doubles and triples. supposedly, the stretch between doubles was a record until jamie moyer hit one 19 years after hitting his previous double. i don't know if the triples gap is a record, but i do know that art herring was a dodger double dipper. more 1978 topps through the mail successes! how about some vintage duke?